Remember when Marvel and DC jointly released Amalgam Comics, which blended two companies' characters into one? Imagine what they could have done if they'd mixed this Cobra, Klaus Voorhees, with DC's Kobra, Jeffrey Burr - especially if they'd kept the angle with him having a twin brother named Jason. The leader of the Serpent Society, Klaus Voorhees uses powerful venom to strike down his enemies. 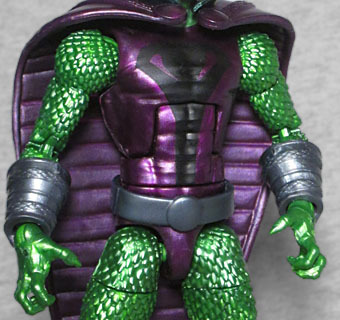 Much like Mattel's Kobra was sold as "Lord Naga," this figure is sold as "Serpent Society." Why? Hasbro owns GI Joe, so it can't be an issue with the name "Cobra" there; in fact, given the state of that brand at the moment, you'd think they'd want to put out a toy named Cobra, if only to shoo other groups away from the name for a little while. Were they worried about brand confusion? If they'd done a swap figure with Cobra, maybe Sidewinder or some other member of the Serpent Society, the choice of name might make sense, but as it is? Some kind of legal/corporate machinations we wee collectors are not privy to. 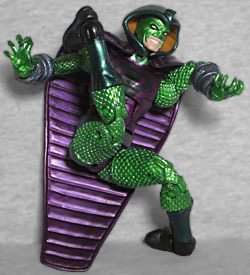 Cobra uses the Hobgoblin/Green Goblin mold, which makes sense since his costume has traditionally been scaly green armor under a purple tunic. He's also usually shown with the suit going all the way down to his feet, like footie pajamas, but this toy gives him smooth shins to suggest boots. He also gets silver bracers that are meant to create the special dart-firing gloves he wears - that's how he delivers that venom to his enemies. He also gets a new cape, a massive piece that reaches all the way to his ankles. It's wider than his shoulders, but gets narrower as it lowers, helping to make him look like a snake from behind. 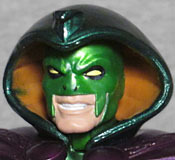 And fitting with the elipid theme, he wears a big billowing hood over the mask that conceals his face. The mask is green, with black-rimmed yellow eyes and an exposed chin, while the interior of the hood is a darker yellow. There's a snake crest on the forehead, which, when coupled with the hood around his human head and the snake-face pattern painted on his chest, gives the impression of three successively smaller cobra heads stacked on top of each other. Like if we could zoom in, we'd see an even smaller one on the crest, then an even smaller smaller one on that. Cobra got his powers in a typical comicbook way: he was bitten by a radioactive cobra. No joke! He was also aided by an experimental venom antidote, but there you go. And what powers does he have, exactly? Pretty much the same as DC's Copperhead: he's a super-human contortionist; his bones don't breat and his muscles don't tear, and he can squeeze himself through an opening as small as 4". His costume is even coated in silicon and graphite powder to help with that. There really isn't any such thing as a non-super-articulated Marvel Legend, so he's got plenty of joints to show off what he can do (even though there are other bodies that have more). The figure doesn't come with any accessories, just a piece of the BAF Thanos. It's a very important piece, however: the left arm with the Infinity Gauntlet on it! 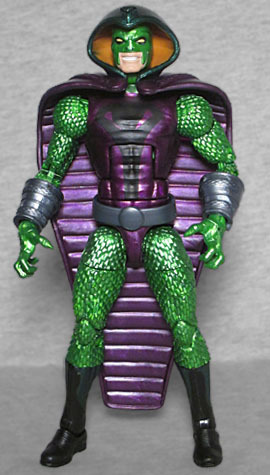 Cobra is a pretty cool-looking toy, even if you don't know or care about the character. And even if it's damn apparent that he's just a "we already have these molds, what else can we use them for" release. Plus, if nothing else, he'll be someone for Cottonmouth and Eel (and sometimes Constrictor) to hang around with.